If there’s anything the MSX is known for, it’s badass Konami games. They pretty much single-handedly kept the MSX afloat, or at least it would seem from all the awesome Konami games on there. 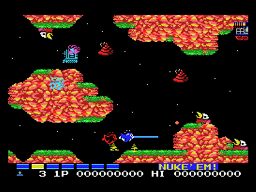 It’s like Activision with the Atari 2600, yo. Okay, enough making stuff up. Who doesn’t love Parodius? 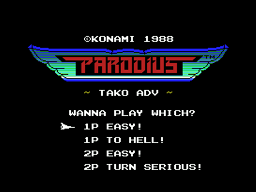 Conceived of as a parody of Gradius (get it), Parodius probably has just as many sequels as Gradius does, including a really weird one on SNES. If you’ve played the NES or SNES versions, which I assume most people who are reading this are more familiar with, you pretty much know what to do here. 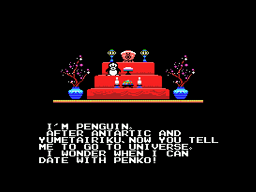 A&L Soft originally released this as a translated ROM image. The Whirlpool took this and created an IPS patch, so that people with a legitimately obtained original Japanese ROM image could play this game with a clear conscience. Romhacking.net is hosting this patch with the Whirlpool’s exclusive permission. Keep in mind that this is only for the ROM version of the game. 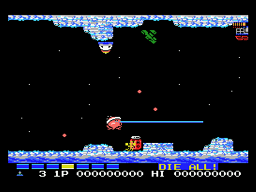 If you go to the A&L website you’ll find other distributions, including a disk image more easily playable on real MSX systems. Not that we would suggest such a thing, of course. The difference with this Parodius is it has a lot more story than most iterations. And while it’s not translated all too well (Big Viper?! Blasphemy! ), it’s understandable enough. More than its original Japanese, at any rate. Translator Takamichi Suzukawa has also translated the manual for your loving enjoyment.